On the morning of the twenty-ninth day of the twelfth lunar month in 2005, snowflakes were fluttering down. After having breakfast, Zhou Ying, with a heavy heart, went outside pushing her bicycle. Two days later, it would be the Spring Festival. As the old saying goes, “One misses his family all the more on every festive day.” So her mind went to her husband, son and daughter…. I haven’t seen them for over three years. How are they? At that time, the couple of the host family went out to see her off and said, “It’s snowing. Come back earlier this afternoon. And celebrate this Spring Festival with us!” Zhou Ying nodded to them. Their short words deeply touched her heart. She couldn’t help shedding tears of gratefulness. By then she dared not turn around or speak lest they saw she was in tears. At this point, a rush of cold air drove into her face, instantly bringing her to the real world from the memory. It would be the Spring Festival two days later. Seeing others spend it with their families, she was a bit homesick. Just then God’s words appeared in her mind, “The path that I’m leading you on is My work, My responsibility, and it was ordained by God long ago so that we would be predestined to come this far, until today—that we have been able to do this is our great blessing, and although it has not been a smooth path, our friendship is everlasting, and it will be passed down through the ages. Whether they were cheers and laughter or sadness and tears, they all make up our beautiful memories! Maybe you should know that I do not have many days for My work. I have so many work projects, and I cannot accompany you often. I hope you can understand Me—because our original friendship is still the same. … I hope that the things we shared in the past may become the flower of our friendship” (“The Path… (8)” in The Word Appears in the Flesh). Her tears began to pour down her face. She really felt that God was by her side and was comforting her with His words. She clearly knew that in experiencing God’s work, whether it is persecution or tribulation, God’s will is to perfect and save man. At the moment, feeling God’s love, she was not lonely, because God was with her. The snow had ceased falling and the sun came out. The sunlight shining down on her body, she felt so warm in her heart and also acquired confidence. She pedaled her bicycle to the meeting location. 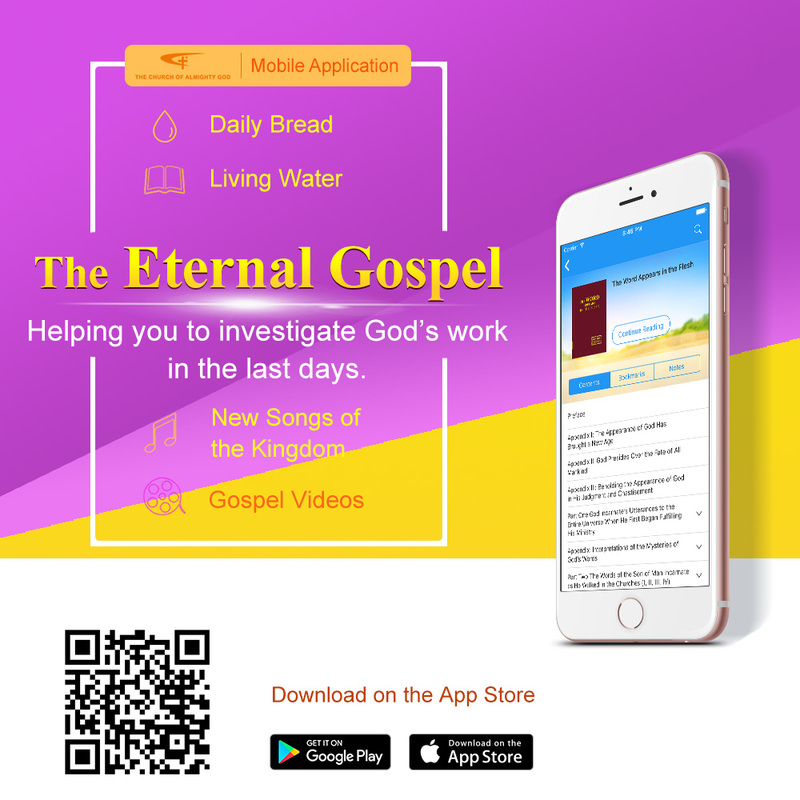 On the way home, she felt she gained a lot at this meeting, realizing that every one of us, coming into this world, has our own mission, and that her mission is to cooperate in spreading the kingdom gospel of God to complete His commission. 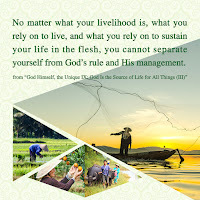 She remembered Almighty God’s words, “From the moment you come crying into this world, you begin to perform your duty. You assume your role in the plan of God and in the ordination of God. You begin the journey of life” (“God Is the Source of Man’s Life” in The Word Appears in the Flesh). The words of God made her understand more clearly: Everyone lives in the ordination of God and all things in the universe exist under the sovereignty of Him. Everyone’s breath is from Him; no person can exist independently and all of us enjoy the gratuitous provision and nourishment of Him. She felt assured to commit her husband and children into God’s hands and allow Him to rule over their subsequent fates. She was aware that it was due to God’s ordination that she could come before Him and that doing her duty as a created being was the performance of her own obligations, which was even more God’s exaltation. She thought that thanks to God’s care and protection, she could come this far; due to God’s leading, she walked out of the negativity and weakness and all manner of dangerous situations. At the same time, she got acquainted with a number of brothers and sisters who were strange to her and weren’t her relatives but were even closer than relatives. She returned to the sister’s home happily, and spent the Spring Festival’s Eve with them. Although she wasn’t reunited with her family, yet having God’s love and the sister’s company, she did not feel lonely.